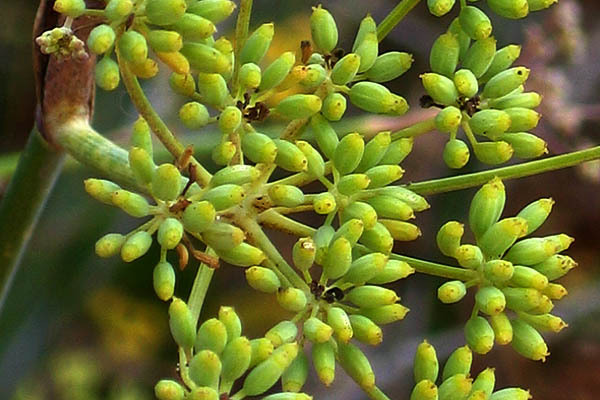 Inflorescence: Compound umbel with 15-40 spreading-ascending rays, each 1-4 cm long. Hippocratus (c.460-c.377 BCE), a Greek physician, described the herb as a stomach soother to treat infant colic. Dioscorides (ca. 40-ca. 90), an ancient Greek physician, pharmacologist and botanist, deemed it an appetite suppressant and recommended the seeds to nursing mothers to boost milk production. 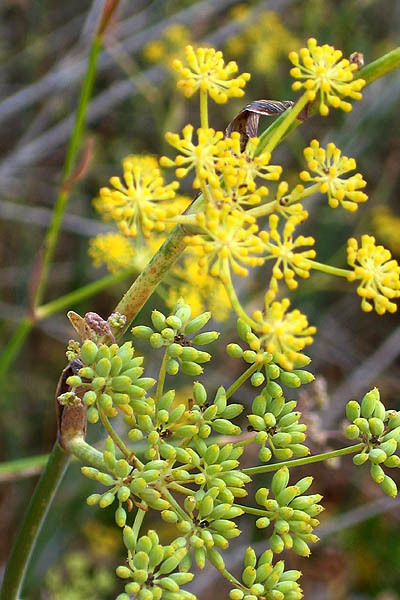 Pliny(23-79 CE) included Foeniculum vulgare in 22 medicinal recipes and noted: ". . . serpents eat it 'when they cast their old skins, and they sharpen their sight with the juice by rubbing against the plant." John Milton (1608 – 1674), an English poet,in his epic poem Paradise Lost, alludes to the aroma of the plant: "A savoury odour blown, Grateful to appetite, more pleased my sense Than smell of sweetest Fennel." Henry Wadsworth Longfellow (1807-1882), a United States poet: "Above the lower plants it towers, The Fennel with its yellow flowers; And in an earlier age than ours Was gifted with the wondrous powers Lost vision to restore."